Just thinking about blackberries takes me back to my childhood. They remind me of hot summer days, growing up on the farm in Fairhope Alabama where blackberries grew wild along the fence rows. We’d pick giant bowls of berries and my mother would make glorious jars of jam and pans of warm, gooey cobbler. Those days are long gone, and my berries come in 5 ounce plastic containers from the grocery store. Still I love to have them often and in myriad ways- in smoothies, yogurt, pie and cake. 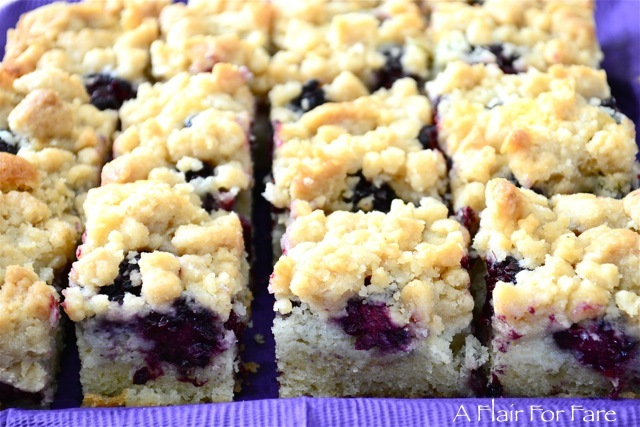 These blackberry crumb bars from Everyday Food are moist, buttery and just sweet enough to take me back to those summer days once again. Prepare an 8 inch square baking pan. Butter the sides and bottom, then line the bottom of the pan with parchment paper, leaving an overhang on two sides. Next, butter and flour the parchment paper. For the topping, whisk together melted butter, brown sugar, and 1/4 teaspoon salt in a medium mixing bowl. Add 1 cup flour, and mix with a fork until large moist crumbs form. Refrigerate topping until ready to use. In another medium bowl, whisk together remaining 3/4 cup flour, baking powder, and remaining 1/4 teaspoon salt; set aside. In a large mixing bowl, beat room-temperature butter, confectioners’ sugar, and vanilla with an electric mixer until light and fluffy. Add eggs, one at a time, beating well after each addition. Reduce speed to low; mix in flour mixture. 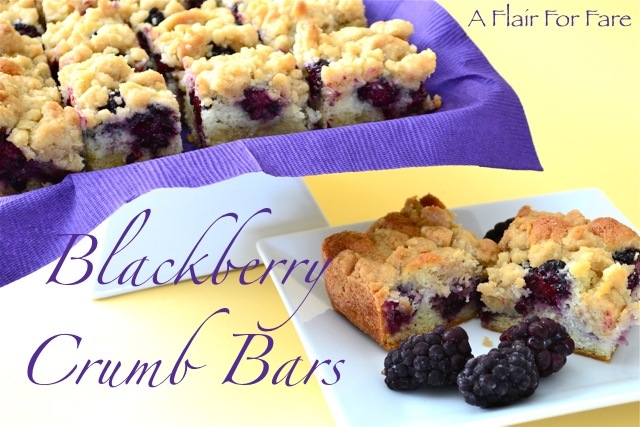 Spread batter evenly in pan; sprinkle with blackberries, then chilled topping. Bake 40 to 45 minutes, until golden. Cool completely in pan. Using paper overhang, lift cake onto a cutting board and cut into squares.